Throne of Glass. I expected kickass stuff from this one.. Well, there's really no kickass stuff even though it said on the blurb that it involves Adarlan's greatest assassin, Celaena Sardothien- who served a year sentence on the salt mines of Endovier. She is a very strong character. I like the edge and menace on her thoughts and voice. Though, i did not get the death defying action that I deserve after having a Mockingjay , Sarah J. Maas gifted me with a good fantasy story with a hot bombshell who can kill better than any other assassin. Err. Sort of. Celaena's killing skills are not enjoyed and showed very much in here. She's to play the underdog. And it's frustrating.I like the concept and the pace is fair. I'm thinking of The Hunger Games, The Selection and Mara Dyer all at the same time when I was reading Throne of Glass. It's like all of them are compressed into this novel and BAAAM! I was blown away.And anybody who reads my reviews will know that what I love the most are love triangles. and squares. if possible. kidding. I love LOVE TRIANGLES that are swoon worthy and impossible to make a choice between two good stuff kind of love triangles. 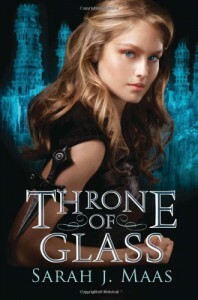 [a:Sarah J. Maas|3433047|Sarah J. Maas|http://d.gr-assets.com/authors/1269281353p2/3433047.jpg] gave me that. In the yummy form of Prince Dorian and Captain Chaol Westfall. Oh God. I love that the love story brewing in here is slow and realistic. The main focus of the story however, is the mystery behind the killings of other champions. I mean, where is the gore?? where is the action from the eliminations if they are being half-eaten by a monstrous creature??? I want Celaena to do the assassinations! But well.. it's still a good mystery though. I feel a lot like Nancy Drew. Biting my nails and everything while turning the pages. HAHA!A lot of names and terms here are quite a mouthful and I keep messing up their pronunciations at first. Though, I wouldn't say that the Wyrdmarks are not interesting enough.So, overall, this was a fun read and so swoon worthy. I can't help shipping Celaena and Chaol though. I like that he is enigmatic and a bit mysterious. The whole glass palace is a mystery too. Even elements of fashion and glamour are present in here.I would definitely read the sequel and look forward to the mystery behind the palace, the Wyrdmarks and the king's secret agenda. 5 stars!